I’ve been creeping up the east coast since I left Jacksonville Beach – in an insane way of trying to push winter back into the north. In some ways, this has worked magnificently in seeing green grass come up when it was quite chilly on arrival. Starting today, the forecast for this east coast – either north or south of where I was – was calling for cold unstable weather once again. Did I want to stay in stealth mode or move on. I chose to move on, but had to leave 2 days earlier then planned to avoid driving in the changing weather. 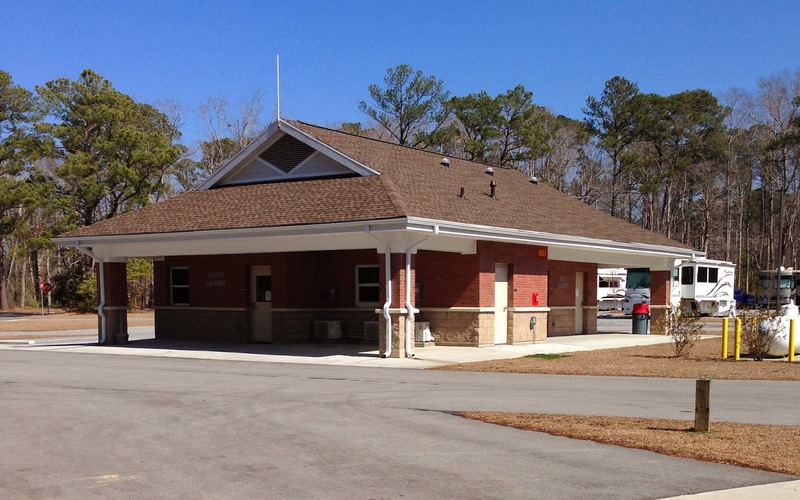 Here is at Cherry Point Marine Corp base. 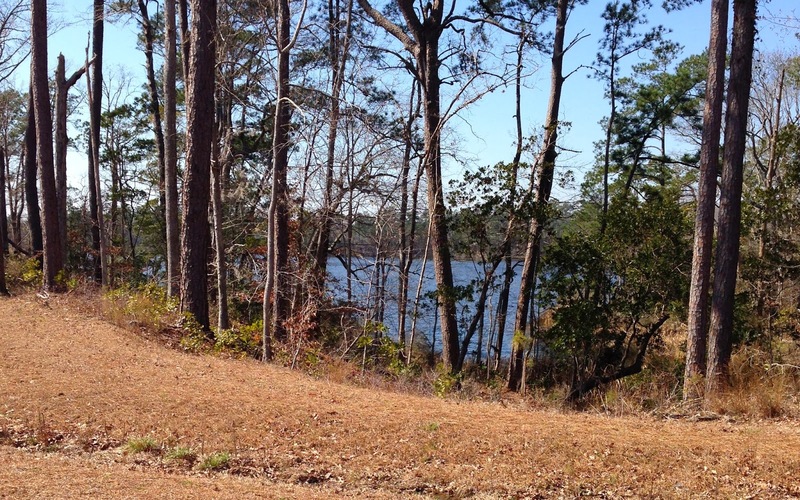 A beautiful base – right up there with the AFB’s I have been fortunate to habitat. 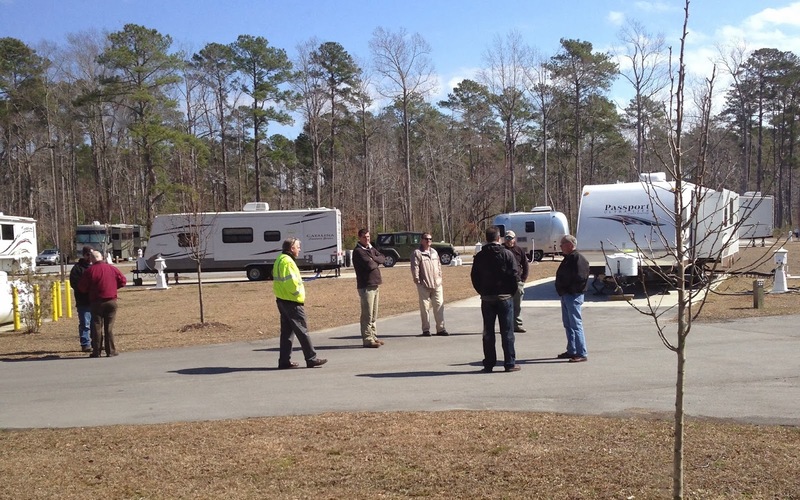 Pelican Point RV Park is near the Neuse River. My spot is nestled next to an arm of the Alligator Gut/Tucker Creek which appears to be neither off of the Neuse River. On the map looks like a squiggly branch of water. Other than helicopters and a few planes training overhead during the day, we are far removed from the majority of the base – so it is quiet. 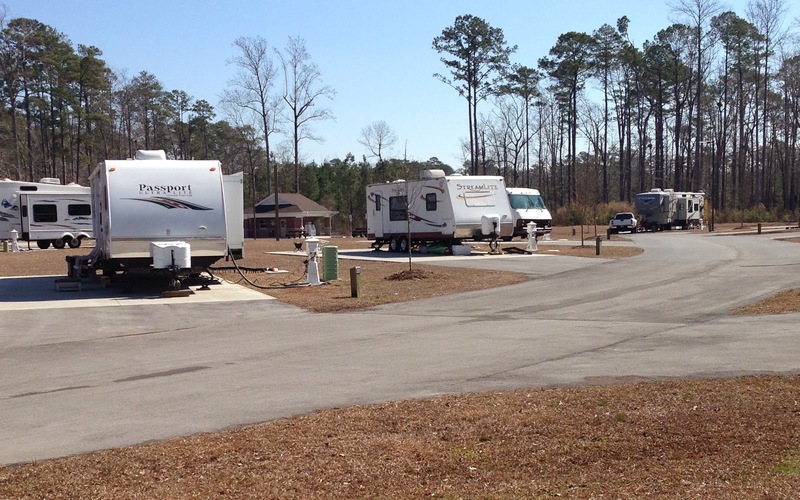 Pelican Point is a new RV park as of July 2013. New enough – that this winter, they had to shut down 1/2 of the park (15 spaces) in early February due to water line freezing and busting. So I got one of their last remaining spaces. Maximum stay here is 30 days. The following pic reminds me of “How many men does it take to change a lightbulb?” This group of men are the decision makers on fixing the water lines, fixing asphalt issues, and who knows what else. The guy in red jacket seems to be the main fella, but they each obviously has their own opinions too. The tree planted next to each site – as in all the trees planted here, are cherry trees. Despite the freezing at night temperatures… there are new buds on this tree. Here’s hoping they will pop out while I am here. Well it has taken me 4.5 hours to download 4 pictures… and the first 3 took 3/4 of that time. I have no friends or family in this area. So I plan to hibernate when its cold to do some weaving. If it get nice, will change that. Am still waiting for winter to lift out of Virginia.. stubborn winter this year.